Mei’s life has just changed, big time. Her mother has remarried, she’s just gained one pesky brother and lost another much loved one to University, and her step-father has taken-over the farm. Feeling she’s no longer important to her mother, Mei simply packs her up her beloved chickens, Little and Lo, and sneaks off to the city. Most kids would simply give-up on such a venture when the ticket-seller refuses to sell an unaccompanied child a ticket to the city, but Mei and her new-found friend, a lovable street-urchin named Cap, are made of tougher stuff. On the way they have lots of adventures. 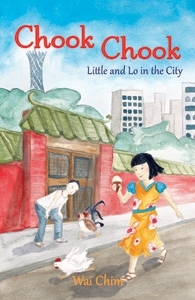 The chooks help to catch a thief in the big city. But their luck runs out when they are discovered in brother Guo’s dormitory and the chooks appear destined for the chopping-block. However, the children apply a bit of quick thinking and tell a brilliant tall story that even Tom Sawyer would have envied, to save the day. This book is about loyalty and friendship and an issue that affects many children – questioning their place in the world following their parent’s re-partnering. Although the story is upbeat, it is also interspersed with the darker underlying theme of unwanted children in a country as large as China. As this is aimed at younger readers, Cap’s future appears rosy at the end as he gains a mentor. Sadly many children are not so fortunate. A lively adventure for children aged 7-8 and above. This book follows characters first introduced in Chook Chook – Mei’s Secret Pets, although it is not needed to enjoy this novel, as it certainly stands alone on its merits.